GIT has been in business for 10 years and as we look back it has been a wonderful blessing! We are a team and we call our customers, “Players” on the team. 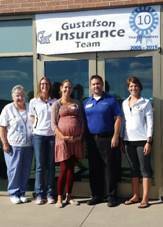 We are your Coach to help you through the insurance experience. This is a great time to reflect, not on our accomplishments, but on those people and Players that have supported and entrusted their business with our agency. Whether it was my Aunt that we saved $1,000/yr, that customer who had some unfortunate violations and needed affordable car insurance, or that friend who bought a house and started a family that needed home and life insurance. This agency has been built 1 Player at a time through friends, family and referrals. It's been a great way to build and develop those relationships. We take pride in getting to know our Players and in doing so, you can trust that we will do everything we can to be of value to you. So, if you know us, give us a chance or refer someone to us that could benefit from the same service you have received. We believe that we provide a unique and valuable service to our Players. Although I've just been in business for 10 years, insurance is all I've known and worked in since college… almost 20 years ago. Michelle Julius, our Lead Service Agent, came over to our agency almost 3 years ago from State Farm where she spent 11 years. We know the business and take pride in being there for you in your time of need, especially if you ever have a claim. As we look forward to the next 10 years, we plan on growing our agency through genuinely caring for those existing Players or anyone that brings there business to us. We sell all lines of insurance; Auto, Motorcycle, RV, Boat, Personal Umbrella, Home, Business, Life and Health. As an independent agency, we represent many insurance carriers and can usually find competitive rates with a reputable company and hopefully save you money along the way. I am so incredibly proud of my husband Scott Gustafson. Last week he had his 10 year anniversary party for GIT Insurance. This is a company that he built from scratch. Customer by customer. Most agencies are bought or inherited but he worked incredibly hard on his own to create a very successful business. He is a wonderful agent that is very dedicated to his customers. In the 9 years I have been with him I have gotten to see firsthand how hard he works to get people the best fit for their needs. He has answered the calls at all hours of the night, he has been in peoples wet basements, on roofs, at accident sights, and he has built many great relationships with other businesses and genuinely refers people to the right places. He is passionate about giving back to the community in many different ways. He genuinely cares for everyone he insurers and I think he is a wonderful asset to the DC-G and Waukee communities as well as all of his customers across Iowa and Minnesota. 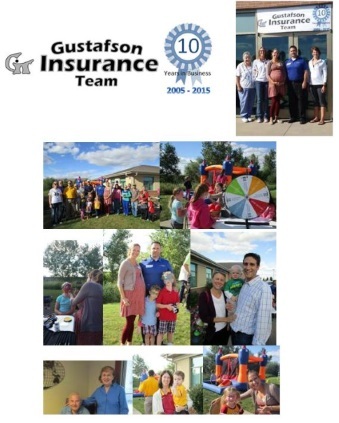 Our boys have a wonderful, hardworking role model and I can’t wait to see what the next 10 years brings for Gustafson Insurance Team.